Ian McKellen has had no shortage of iconic roles throughout his storied career, from Magneto in X-Men: Days of Future Past to Gandalf in The Lord of the Rings and The Hobbit trilogies. 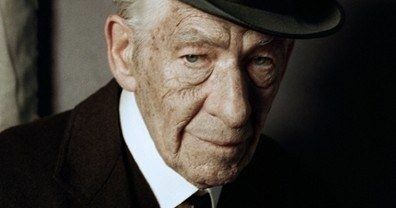 It's possible that the actor may have found a way to top all of those roles with his next project Mr. Holmes, where he plays a 93-year-old Sherlock Holmes. Earlier today, the actor sent out the first photo from this drama to his Twitter followers, which you can take a look at below. The actor signed on to star as the legendary detective back in September, when the project was known as A Slight Trick of the Mind. The story is adapted from Mitch Cullin's novel, which is set in the year 1947 and centers on a retired Sherlock Holmes living in a Sussex village with his housekeeper and her son, who also wants to be a detective. Holmes is still haunted by a 50-year-old unsolved case which he can only remember fragments of. Laura Linney also stars in the adaptation. Bill Condon, who directed Ian McKellen to his first Oscar nomination in Gods and Monsters, is directing from a script he co-wrote with Jeffrey Hatcher (The Duchess). Anne Carey, Iain Canning, Emile Sherman and Aviv Giladi are producing, with shooting already under way. Are you excited to see what Ian McKellen can do with a legendary character such as Sherlock Holmes? Chime in with your thoughts below.